Apple appears to have tipped the release of Amazon's long-awaited Amazon Prime Video app in an App Store listing this week, which suggests the title is not only coming to iOS, but Apple TV as well. 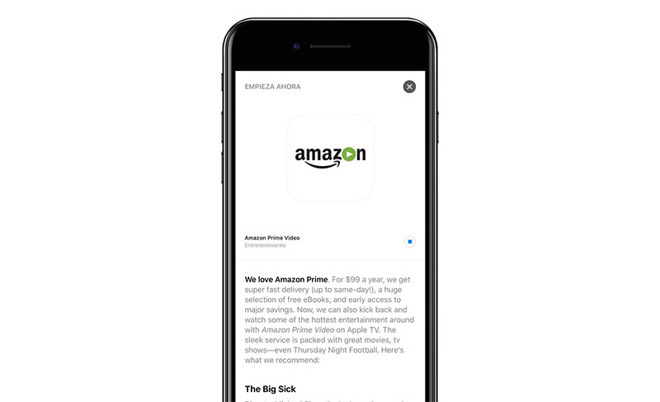 Spanish blog Applesfera spotted the Prime Video app on the iOS App Store on Tuesday, complete with promotional text written by App Store editors. Seen above, the entry has since been removed, but a screenshot of the post provides some telling information about the coming release. We love Amazon Prime. For $99 a year, we get super fast delivery (up to same-day! ), a huge selection of free eBooks, and early access to major savings. Now, we can also kick back and watch some of the hottest entertainment around with Amazon Prime Video on Apple TV. The sleek service is packed with great movies, tv shows—even Thursday Night Football. Of note, the promotional snippet, thought to be part of a feature in the App Store's "Today" tab, mentions Apple TV compatibility. Apple first announced Amazon Prime Video would arrive on tvOS during a presentation at this year's Worldwide Developers Conference in June. Since then, however, neither company has mentioned the app or pegged an exact launch timeline. Subscribers of Amazon's Prime service have for years pined for an Apple TV version of the streaming video app, but the online retailer has been reluctant to strike a deal with Apple. Agreeing to App Store terms would open Amazon up to Apple's usual 30 percent cut of all revenues, including in-app purchases. Things got complicated when Amazon entered the streaming device market with its line of Fire TV devices. The online retail giant subsequently halted all sales of Apple and Google streaming products in October 2015, citing potential customer confusion over which units support Amazon Prime Video. With a deal now in place, Amazon is expected to not only release the long-awaited tvOS app, but also reinstate Apple TV sales on its online storefront. When, exactly, Amazon Prime Video for tvOS will arrive is unknown, but its appearance as an App Store feature suggests a launch could occur in the next few days. According to a Reddit thread, the app could go live as soon as tomorrow. A user who set their iPhone's date ahead to Dec. 6 was able to view the "Today" promotion in the App Store, and link other redditors to the same page for a brief period before Apple pulled the page.